breeds | what a dog's life! So what’s going to happen dogwise in the White House? Mali and me have been discussing this for a while. Apparently, they are going to get a Portuguese Water Dog, although they favoured before a Labradoodle. “The Portuguese Water Dog was originally a hunting dog introduced to the Iberian Peninsula by Moors from North Africa; it is as a fishermens dog that he excels. Loving water, and accomplished diver, he would accompany them on voyages, retrieving nets or tackle that had fallen overboard and taking messages from ship to shore by carrying them in waterproof cylinders. The Portuguese Water Dog is described in the Breed Standard as being “self-willed” and as a puppy he needs to be challenged to reduce his tendency to stubbornness. Very intelligent and energetic he is obedient to his owner but needs the opportunity to use his energy constructively. Mamma Mia! We Labradors sound like pussycats, compared to this piece of hard work… No, I’m not jealous! And I wouldn’t certainly like my bottom part and tail been shaved like a spaghetti! I wonder if you have already heard about this new breed of Labradoodles? Sounds like a joke, I know, but it’s dead serious. They look very woolly and sheep-like, compared to me, and appear to be bread for people who are allergic against our coat hair and “SMELL”!! (I wonder who dares calling my natural odeur like this!?). 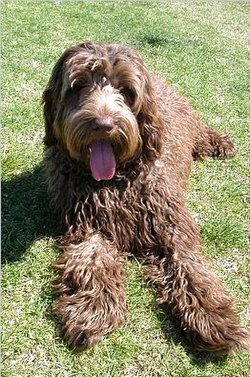 A brown Labradoodle with a fleece type coat. The appearance of Labradoodles may vary. A Labradoodle is a crossbred or hybrid dog created by crossing the Labrador Retriever and the Standard or Miniature Poodle. The Labradoodle was first deliberately bred in 1989, when Australian breeder Wally Conron first crossed the Labrador Retriever and Standard Poodle for Guide Dogs Victoria. His aim was to combine the low-shedding coat of the Poodle with the gentleness and trainability of the Labrador, and to provide a Guide Dog suitable for people with allergies to fur and dander. Guide Dogs Victoria continue to breed Labradoodles today and Labradoodles are now often used around the world as Guide, Assistance, and Therapy Dogs as well as being popular family dogs. The Labradoodle as a dog breed is still developing, and does not yet “breed true,” i.e., puppies do not have consistently predictable characteristics. While many Labradoodles display desired traits, their appearance and behavioral characteristics remain, from an overall breed standpoint, unpredictable. As such, Labradoodles’ hair can be anywhere from wiry to soft, and may be straight, wavy, or curly. Some Labradoodles do shed, although the coat usually sheds less and has less dog odor than that of a Labrador Retriever. Like their parent breeds, both of which are amongst the world’s most intelligent dog breeds,Labradoodles are very intelligent and quite trainable. Labradoodles can be taught to obey verbal or sign language commands, or both, and remain commonly used as guide dogs for disabled or handicapped persons around the world. 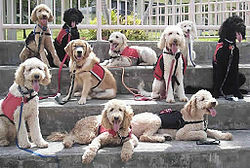 A group of Labradoodle Assistance Dogs. There is no universal consensus as to whether breeders should aim to have Labradoodles recognized as a breed . Some breeders prefer to restrict breeding to early generation dogs (i.e. bred from a Poodle and Labrador rather than from two Labradoodles) to maximise genetic diversity, in order to avoid the inherited health problems that have plagued some dog breeds. Others are breeding Labradoodle to Labradoodle over successive generations, and trying to establish a new dog breed. These dogs are usually referred to as Multigenerational (abr. Multigen) or Australian Labradoodles. Australian Labradoodles also differ from early generation and Multigenerational Labradoodles in that they may also have other breeds in their ancestry. English and American Cocker Spaniel/Poodle crosses (ie Cockapoos), Two Irish Water Spaniels and Soft-Coated Wheaten Terriers have variously been used in some Australian Labradoodle lines. The Curly Coated Retriever were used too, but these lines did not work out and they were discontinued. Labradoodle coats are generally divided into 3 categories: Wool (with tight curls, and similar in appearance to that of a Poodle, but with a softer texture); Fleece (soft and free-flowing, with a kinked or wavy appearance); or Hair (which can be curly, straight or wavy, but is more similar in texture to a Labrador’s coat) . Labradoodles come in a wide variety of colours, including chocolate, cafe, parchment, cream, gold, apricot, red, black, silver, chalk, parti colours, and generally all the colours that can be found in Poodles. They also can be different sizes, depending on the size of poodle (i.e. toy, miniature or standard) used. 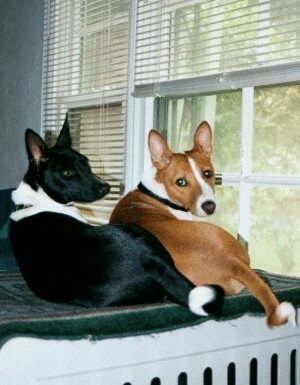 Dogs in Ancient Egypt – was Anubis a Basenji? 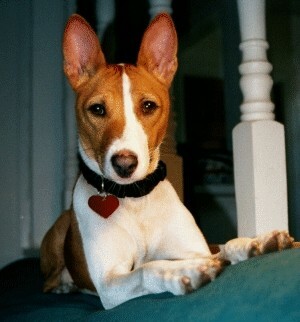 Today I found a very interesting blog, The Basenji in Ancient Egyptian Art, investigating the relationship between dogs featuring in murals and other artefacts of the ancient Egypt – and the existing breed of the Basenji. 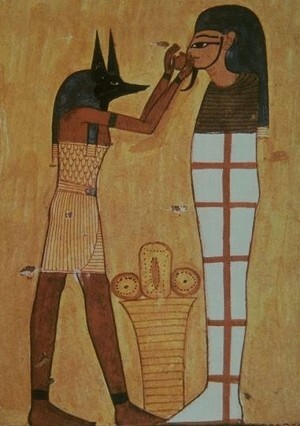 The first picture shows the god Anubis. To me the similarity with good old Anubis seems obvious!